I have read a few dystopian books in the past so i had high hopes for this book and boy i was not disappointed! Music , media ,art , technology all things that enrich our lives giving a feeling or harmony and self expression allowing us to be our selves and have individual tastes! but what would happen if this technology was used against us? what would happen if self expression became a thing of the past and conformity and obedience became the thing of the future? This is the worlds that Cain finds him self in! music has been taken away and destroyed and with it peoples memories leaving people unable to remember music and in Cains case his parents! 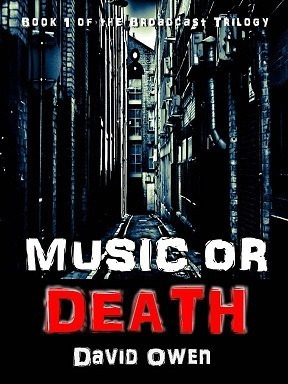 all forms of media have been over thrown by the government, the only music to be heard is the government anthem, played everyday the anthem is like a drug to the music staved population in an attempt to stop crime and force order, how you as in punishment to crime the anthem is withheld! Cain works in a small restaurant full of crimesound officials! In a desperate attempt to escape this life Cain steels a gun and plans to end his life. His plans are halted when the restaurant comes under attack. 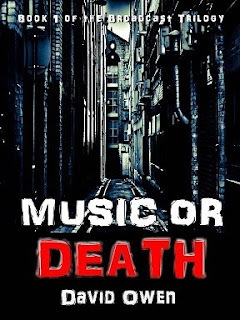 he finds himself thrown in to the world of the MOD (music or death) a group that fights to bring back music and defend the helpless. but when there leader Devin starts suggesting outlandish plans that threaten the life of innocent people Cain must make a decision whether Devin is right and this is for the benefit of the people or whether to take a different path and follow his gut. will he follow Devin or or fight back to save lives? I loved this book! i have never read anything like it! i know a lot of us think about what it would be like without your ipod or phone but this book made me think what it would be like to never listen to music again! to never be able to even rum a tune as a musician ... scary stuff! The book was action packed with twisted at every turn! there was never a dull moment! it will literally have you gripped from the first page! I loved Cain! i though it was nice to see the character in both a vulnerable and strong state. when he is introduced to the reader Cain wants to end is life, hes even willing to risk steeling a gun of a government official! you really feel is desperation to get out out of this situation. when he is working with MOD you can feel his feelings of excitement and determination that he has a chance to make a difference to help people who were like him! you can also feel is sorrow that the people around him have memories of music and family and he doesn't! when he is faced with the choice to rather take drastic action that means innocent people the people he should be helping will die or walk away you see a real internal struggle, it is this that i loved most about this book i found Cain really easy to relate to because you see such normal human thoughts played out! should he take part in this, would it make a difference, would his partners want him to do this.... this are all questions i could imagine asking myself! it is also this feelings that keep you guessing, will he do it? wont he? i have to say i was on the end of my seat!